wear your sunglasses and try this new outing! It's a surprise for RWFF; I hope you'll enjoy it! Let me know your opinion; then I'll tell you about it. p.s. a suggestion: streamers and heavy equipment! That is amazing! I've never experienced this in real life. Thank you, Thank you! Now I'm embarassed That one I posted was just a baby. There are MONSTERS in there. Read the hint carefully - BIG TACKLE!! Reminds of me a game we called "Tug of War" when I was a kid. We'd tie a flag in the middle of a large, long rope. About 15 or so kids (2 teams) would grab hold on each end. The middle of the rope (with the flag in the middle) would be over a large mud puddle. On "GO", each team would try to drag the other team into the muddy water. 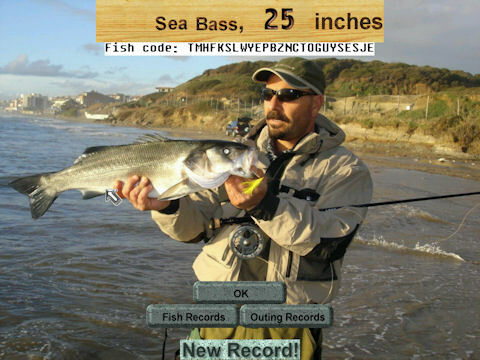 Check out this short video I made of hooking and landing a monster Sea Bass. Massimo: Great addition to the game. I just landed a 36" monster bass. Just like fishing for strippers off the coast of Cape Cod. This outing is great it is just like catching the striped bass out here in the San Francisco bay and delta also a local lake that has produced almost all of the state fly rod records this going to be a fun addition a couple of the site could also be used for bonefish when we get some bone fish pictures. I caught a 32 inch bass and I was wondering when he would give up or would I. I'm going see if I can create lefty's decievers or another fly called the gurgler that we use here. Get thrown out of game. Anyone any ideas how to fix? Not computer whizz so please make it simple. I hope Paul could give us an idea on how to solve it: in your PC or in my outing. I'll do some fishing there (I'm dying to try for the sea bass!) and see if I can duplicate the problem. If so I should be able to solve it fairly quickly. RWFF now has saltwater! Well done! Uninstalled the site and re-installed and seems to be ok. Caught a 27 inch sea bass.